Editor’s note: As promised, we present here a previously unseen bit of work by the renowned 20th-century American detective novelist Ross Macdonald (1915-1983). This 2,500-word fragment of a never-completed yarn is included in a collection of Macdonald’s Lew Archer tales called The Archer Files: The Complete Short Stories of Lew Archer, Private Investigator, edited by Tom Nolan and newly published by Crippen & Landru. Anyone familiar with the 18 Archer novels will recognize Macdonald’s hand here immediately. “Heyday” gives us the sun-burned Southern California backdrop, the rarified world of the wealthy, and a young person in trouble, probably because of some event in his family’s past--all hallmarks of Macdonald’s later work. Why the author never finished “Heyday in the Blood” is anybody’s guess. Maybe he didn’t find the scenario he had set up sufficiently novel; or perhaps he was pressed for time, put “Heyday” aside for a while, and just never found reason to go back to it. At least he didn’t destroy it, or throw it away. Reading the story now causes one to muse on what might have been. What if Ross Macdonald had finished “Heyday”? Would it be thought of today as one of his premier efforts? And what might it have told us about both the writer and his private-eye creation that we don’t already understand? Unfortunately, we will never know. The improbable blonde behind the reception desk gave me the electronic eye. She seemed to see the gun in my shoulder-holster, the label on the inside breast pocket of my jacket, the pair of lonely tens keeping each other company in my wallet, the place where the laundry had torn my undershirt, even the bent rib where a goon had stamped me back in 1938 on a San Pedro dock. It was a long way, in time and space and social attitude, from the San Pedro docks to the Channel Club. “Are you a member?” The question was rhetorical. I signed the piece of foolscap she pushed towards me. She pressed a buzzer which opened the inner door. I stepped through into shimmering blue-green light. It fell from the noon sky and was reflected by the oval pool. A few old people, brown and still as lizards, lay in long chairs along one side of the pool. An Olympic diving tower stood unused at the far end. On the other side, white-coated waiters were setting umbrella tables in preparation for lunch. I could smell ham and chlorine and Roquefort dressing and money. The bar was dim and cool like a ceremonial grotto. The bartender could have been a surpliced Italian priest performing a ritual. He was pouring a gin-and-tonic for a dark-headed woman. She wore sunglasses and a sleeveless white linen sundress with a scarlet and white straw belt. I went up to her. She had a beautiful back, with the deep glowing tone of hand-rubbed mahogany. “Mr. Archer?” she said tentatively. The bartender poured me a bottle of Löwenbräu. I tried to pay him for it. He informed me in a soft religious voice that money was no good here. Everything had to be signed for. “Yes, Mrs. Casswell.” He made a pass with his hand like a benediction. We passed through a court with a half-drawn canvas roof. A shaft of sunlight fell on cubist furniture and semi-abstract murals. A couple of men with vein-webbed noses were sitting in a corner over empty glasses, encouraging each other to have another drink. They nodded to Mrs. Casswell and looked at me from a great alcoholic distance. I hadn’t been born with a silver cocktail-shaker in my hands. The flagstone terrace overlooked a golf course. At the bottom of its green slopes lay a dazzling band of sea. Twenty or thirty miles out, a string of brown hunchbacked islands lay on the bright horizon like basking tortoises. The woman looked at the Pacific and its islands as if they belonged to her. I found out later that one of them did. I waited, sipping my beer and trying to guess her trouble. Her head, dark and small with its Italian cut, had a kind of smooth glaze that seemed impermeable. But she was one of the women who always had trouble. Too handsome and too rich, they wandered from marriage to marriage and continent to continent, searching for something worth finding. She looked up at the sun as if it was spying on her. She was very young to have a son that age. Her skin was as smooth as a girl’s, her body sleek and slender. She crossed her ankles under my stare, pointing her toes like a ballet-dancer. “I’m thirty-four,” she said. “Entre nous. I’ll soon be thirty-five. I don’t mind telling my age as long as I look younger than I am. It’s the other way around that hurts.” She took off her glasses and swung them. Her eyes were blue, and older than the rest of her, a little hard, a little dazed by the unfiltered light or by undiluted experience. She put the glasses on again, turning her profile towards me. The straight nose met the brow without an indentation. It was the profile that Greek sculptors loved, that spread along the Mediterranean to Sicily, to Spain, and crossed the Atlantic when Spain raped Mexico. I knew more about Ben Gunderson. I kept it to myself. She plucked at the skin on the back of one hand with the red-tipped nails of the other. I thought and didn’t say that she seemed moderately sane for a woman of her age and class. One thing besides her money made me a little nervous, though. Her thought revolved in obsessive circles around herself, returning to the beloved subject like a hawk to a wrist. “Of course you’ve been in touch with his friends,” I said with some impatience. She pondered her answer. Before it came, there were quick light footsteps on the flagstones behind us. It was a man in morning clothes, carrying a menu. He was small and neat-looking, with crisply waved grey hair. He looked at me with surprise and recognition, but waited for me to speak. He nodded blandly, to her and then to me. He was a Swiss with a heart of German silver and a politician’s brain. He spoke six languages, including Romantsch, and also understood the uses of silence. I got up to shake hands with him. After a lunch which Mrs. Casswell hardly touched, I followed her Lincoln home. Her estate lay along the sea between the club and the city. We entered through iron gates and drove for several hundred yards along a gravel drive. There were polo grounds on one side, which looked disused; on the other a landing-strip for light planes, and a bright new metal hangar. The house belonged to the hashish school of Spanish architecture. Probably early nineteen-twenties and imitation Mizener, which made it the imitation of an imitation which wasn’t worth imitating. It was a ponderous monstrosity with thick walls, meager windows, insane turrets. Somebody with a hidalgo complex had tried to jail a dream of happiness. The prisoner had probably died, or lost its mind. I watched Mrs. Casswell leave her car and mount the low front steps. Her movements seemed unwilling. She waited for me under the Moorish arch which hung over the front door. She opened the door like a mourner making a duty call at a mausoleum. The air in the living room was chilly and stale. There was dust on the heavy dark furniture, dirty glasses on the closed top of the grand piano, tarnish on the gilt scrollwork of the picture frames, cobwebs in the angles of the beams. She looked around the giant room as if she was seeing it through my eyes. If you’d like to learn more about the handsome front cover of The Archer Files, check out Duane Swierczynski’s interview with artist-designer Jeff Wong at The Secret Dead Blog. What a great piece to introduce this new collection. Cha ching to the credit card. Did Nolan say how many of these stories did he find? 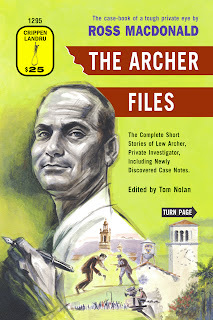 Tom Nolan says that he found 11 unpublished fragments of Macdonald stories, all of which are included in THE ARCHER FILES.